Image from book published in 1872. Every state in our nation has a number of historic sites. The oldest are locations of Native American habitation dating to times before the Colonial Period—these are termed “prehistoric” rather than “historic.” In order to recreate or restore a very early Native American garden, researchers must rely on archaeological evidence and oral traditions to determine what was grown and how it was grown. One such example is the Kipahulu Living Farm in Hana, Hawaii. Plants grown in Hawaii by Native peoples prior to the arrival of Captain Cook in 1778 have been collected and preserved at this garden. Gardens like this are a fascinating, educational experience to visit. Anyone seeking to recreate or restore a garden from the Colonial Period or later would be able to consult written records of various types as well as archaeology and oral traditions. The United States National Park Service has developed methods and techniques for the preservation, restoration, reconstruction and rehabilitation of the gardens and architecture of historic gardens. Charles Birnbaum (1996) has written a book for the National Park Service outlining four defining methods of approach to restoring and recreating a historic garden. In the approach of preservation, nothing is added or taken away from the garden; what is there is protected and preserved for the future. The William Gibbes House garden in Charleston, S.C., designed by Loutrel Biggs in 1929, has been carefully preserved in its original form to the present day. A second approach is restoration, in which a garden is made to accurately reflect the landscape at a specific time period of historical significance. The Borroughs Plantation in Hardy, Virginia (where Booker T. Washington lived as a slave around 1860) is a good example of the restoration of a living historic farm. Reconstruction recreates a garden or part of a garden that has since disappeared, except perhaps for the knowledge of where it was located. This has been done at Mission Santa Barbara in California, where the historic mission huerta, or orchard garden, has been reconstructed using cuttings and seeds of plants grown at the mission in the late 18th century. A fourth and final approach to a historic garden is rehabilitation, which brings elements from the past history of the site and applies them to a new use of the property— an adaptation to its use in a new way. This has been done in many places in the U.S., such as in Monterey, California where private businesses have been allowed to occupy as well as preserve historic buildings and gardens. There are several research processes we can undertake to restore or recreate a period garden around a private dwelling or a national historic site. The site should be surveyed, that is measured and carefully studied. If possible, the garden should be observed over the period of several months to a year to take note of plants that may be dormant, or not visible part of the season. An example might be spring-flowering bulbs that appear in March, go dormant and disappear by the end of May. The site might be studied for architectural features such as remains or indications of paths, walls, fences, fountains, irrigation ditches, and the layout of beds. Lawn grass may grow shorter over buried paving, paths, or fallen walls. Early engravings, photographs or postcards are invaluable for reconstructing historic gardens to a specific time in the past. Occasionally, newspaper clippings, garden plans and/or plant lists are available as well. During the 1870s many counties in the U.S. published atlases of important residences in their area. These can be extremely useful in reconstructing a garden of that time period. Old herbals and antique catalogs can be consulted to identify plants still existing on heritage sites. The style of the building( s) on the property will lend information to the period of the garden, or plants still remaining after buildings have disappeared can be studied and placed in historic context. Rose or peony plants are frequently easier to identify than old perennials, because of the greater amount of contemporary information available. The practice of ordering plants through the mail became common after about 1850, so old nursery and seed catalogs are valuable in determining what was obtainable. 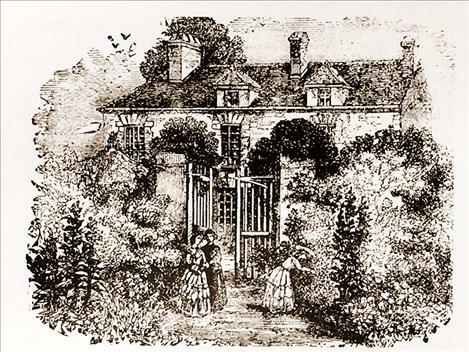 Period gardening and landscaping books will inform how plants were used and often include garden plans or designs. It is important to recognize that gardening styles as well as the purposes and use of gardens has changed and continues to change as time passes. California mission gardens were created for subsistence— that is, for food (grains, vegetables and fruit) and for all the materials needed for medicine, the manufacture of trade goods and fodder for livestock. The few ornamentals included were probably used for decoration of the altar, quite unlike the gardens we see at most of the missions today, which are strictly ornamental. A historic garden that is recreated as living history would necessarily require a good deal of research and should be maintained with the tools and techniques of the specific time period it represents. A historic garden made for a period property and lived in by a modern family could be more easily maintained with modern tools and techniques, though an approach using organic methods would be both more in keeping with historic practices and better for the planet. Present day organic methods are not necessarily historic, though the use of chemicals did not begin until the late 1800s. Nicotine was used as a pesticide from the mid-19th century, and Bordeaux Mixture (copper sulfate) as a fungicide around the same period. The great increase in the use of garden chemicals began in the 1940s and so is not really a significant element in garden care before that time. In the coming weeks I will present some research designs for several historic gardens of various time periods, including plant lists, site plans, and maintenance techniques.